MattingExperts.com introducing two new products by one of the leading US commercial matting manufacturers The Andersen Company - Luxor and Luxor Logo. Undeniably the one of the most luxurious commercial carpet-like mats. It seems that over so many years that commercial matting has been in existence there is nothing one can do to make such simple product exciting all over again yet The Andersen Company does it again. MattingExperts.com would like to introduce two new commercial entry rugs by Andersen Co. – “Luxor” and Luxor Logo. This entry mat is set apart from most others in the industry by the heavy, 32 ounces of solution-dyed nylon carpet fibers. Defining feature of this mat is a new pattern being offered called “Flame Leaf”. It is a very subtle and elegant pattern especially in the realm of commercial mats. Luxor mat is also available in one other pattern called “Diamond”. This pattern is also subtle but a bit more predictable as far as walk off mats and runners are concerned. The way Andersen is able to make these more understated patterns is by using a combination of looped nylon carpet fibers and cut carpet fibers. Other mats are made by simply trimming the surface fibers in order to create a pattern or are reinforced from the back of the mat in shapes made from molds to create texture. All Luxor mats will feature a vinyl backing and customers have a choice of how the edges are finished. The edges are vinyl which extending from the bottom of the mat out on each side. Alternatively, a serged edge may be used on a mat should customers want less of a commercial look to the final product. Serging is a process where the edges of the mat are sewn (a.k.a. overcast) tightly with a strong thread to prevent unraveling. A truly sophisticated way to display logos or other art/messages on a commercial mat! Even more dense and sumptuous than the Luxor, Luxor Logo is a full 36 ounces of pile per square yard (average mat being around 20-24 ounces). Offered with either a vinyl beveled or serged edge (Mat backing is vinyl). The logo, message or shapes are achieved on this amazing mat by using a combination of cut piles and loop piles. The “background” or canvas, if you will, of the mat is comprised of cut nylon carpet. The logo area is made of looped pile. The result is a gorgeous, tone-on-tone embossed effect. This is truly a mat for discriminating tastes as it conveys brand imaging in a very understated fashion. A burger joint might choose a logo mat with 7 bright colors on a black background to reinforce their laid-back food and atmosphere. But imagine a law firm or doctor’s office and you begin to envision the perfect settings for the Luxor Logo Mat. So for a truly beautiful mat in your business, professional office, restaurant or home, these two new mats we are offering are sure to fit the bill. Contact MattingExperts.com for a sample of either or both Luxor mats and you will be on your way to owning a “cutting edge” commercial entrance mat of your very own! MattingExperts.com specializing in industrial anti-fatigue and commercial entrance mats went live in 2003. Located in Palos Park, Illinois, a southwest suburb of Chicago, Matting Experts carries mats from over 20 manufacturers. 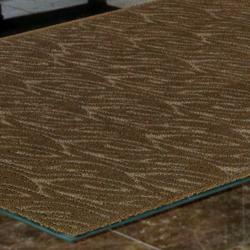 The website features over 200 mats and matting accessories.